FS322E WSU Publications. March 2019. Phytophthora rots can girdle the scion (collar rot), damage the rootstock just below the soil surface (crown rot), and cause necrosis and death of fine roots (root rot). While generally considered a larger problem in rain-fed growing regions with heavy soils, Phytophthora problems occur in Washington, especially where irrigation water carries the pathogen or where irrigation and overhead cooling practices create wet soil conditions for extended periods. Multiple species of Phytophthora have been implicated in crop damage with P. cactorum and P. syringae two of the more significant species. P. cambivora and P. citricola have also been isolated in Washington from symptomatic trees (Yamak et al. 2002; Mazzola and Brown 2010). Trees impacted by crown and root rot may appear to have a slow general decline that from a distance can be confused with winter injury, nutrient deficiency, fire blight, or wet feet (where saturated soils reduce the oxygen level to the point where roots die) (Figures1–4). Susceptible varieties may decline more quickly. 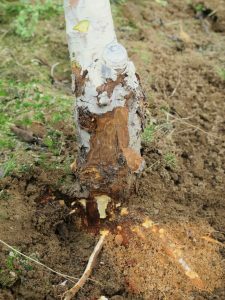 When Phytophthora rots are suspected, inspect the base of the tree and excavate soil from around the trunk and root system to examine tissues for crown and root rot symptoms. Upon peeling back the outer bark of the trunk, the normally green cambium will appear orange or brown. Roots may be a dark brown or orange and may slough off from the primary root. After cutting away the outer bark, a sharp line of demarcation is commonly apparent between the healthy and diseased (orange-brown) tissue. In comparison, roots killed by “wet feet” or drowning generally display an overall brown color and may have a decaying or fermenting smell. 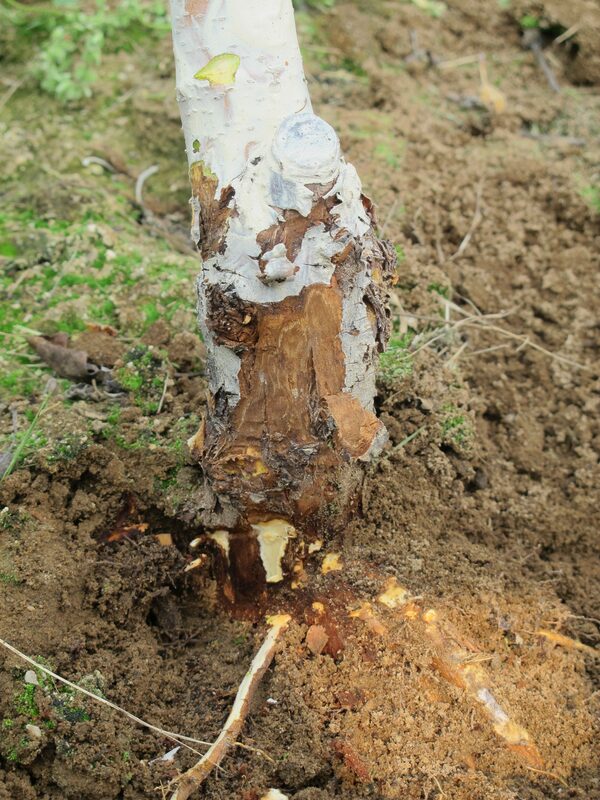 Crown rot (Figure 2) is used to describe the disease when the pathogen affects the lower section of the trunk at the soil line, whereas root rot primarily impacts the tree root system. Collar rot may appear as a dark brown, grey, or purplish depressed canker on the bark of the lower part of the scion which can be confused with fire blight (Figure 4). Trees may have both root and crown rot symptoms. Figure 1 Crown and root rot on apple. Figure 2 Crown rot on apple. Note healthy tissue below the soil line. Figure 3 Cold injury on apple can be confused with crown rot. Figure 4 Fire blight on apple can be confused with crown rot. Several species of soil borne Phytophthora oomycetes (fungal-like organisms) cause root and crown rots. Many of these species are common in most orchard soil. Others can be introduced to an orchard site on contaminated soil, irrigation water or planting stock. Phytophthora spp. persist in the soil as either long strands of mycelium in infected wood or as thick-walled spores called oospores (Wilcox 1992). These oospores are extremely resilient and can remain viable in the soil for long periods of time. When soils are wet oospores germinate forming thin threads of fungal hyphae which can infect plant roots. When soils are saturated another type of spore called a zoospore develop within sporangia. Zoospores are swimming spores. They can move through the soil water to find new roots to attack. However, the soil must be flooded in order for them to swim through the soil and as such zoospores will only develop when the soil is saturated. Spores can also move with water across the surface of the soil in irrigation or run-off, thus transmitting the pathogen over large parts of a block quickly. The longer the soil stays wet the higher the risk of infection. Limit periods of soil saturation. Free water allows pathogen zoospores to move through the soil thus enabling disease transmission over longer distances. Monitor soil moisture and limit the amount of time a soil stays saturated. Irrigate to field capacity when soil moisture and tree monitoring indicate the need, and apply appropriate volumes without flooding soils. When over-head cooling is not properly cycled, soils may remain wet or saturated during the cooling season of July and August greatly increasing the risk of infections. Set your cooling system so that cycles appropriately cool fruit through evaporation. At this level, little cooling water should reach the ground. Choose well drained soils. Whenever possible plant fruit trees in well drained soils. Monitor irrigation water. 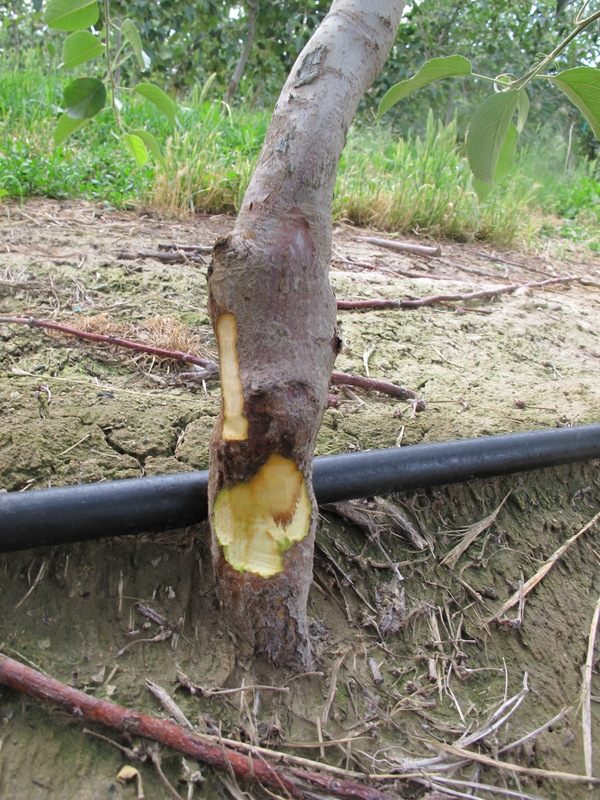 Irrigation water can be a source for Phytophthora infections. 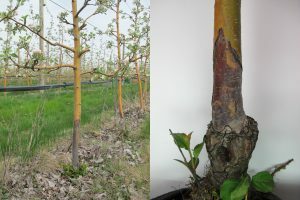 Fruit infections (sprinkler rot) of pear and apple was widespread in the Wenatchee River Valley of Washington when overhead sprinklers were common (1992–1999). Dr. Grove and colleagues found 749 isolates (at least nine distinct taxa) of Phytophthora spp. in irrigation canals in eastern Washington (Yamak et al. 2002). Monitoring of Phytophthora in irrigation water is generally done by suspending fruit in the canal (or water from the irrigation system) and checking for visible fruit rots. Choose resistant rootstock. Among dwarfing-apple rootstocks, Geneva series rootstocks are most resistant. M-9, M-2, and M-4 are moderately susceptible. M-7 and MM-111 are moderately susceptible; M-26 and MM-106 are susceptible; and MM-104 is highly susceptible (Table1). Among stone fruits, plums are relatively resistant, whereas the remainder are susceptible to very susceptible. Mahaleb is the most susceptible cherry rootstock, whereas Mazzard, Morello, and Colt are somewhat more resistant and would be recommended on heavier soils. HR= Highly Resistance, MR = Moderate Resistance, LS = Low Susceptibility, MS = Moderate Susceptibility, HS = High Susceptibility. (Carisse and Khanizadeh 2005)1 (Robinson et al. 2006) 2. Maintain large, active beneficial populations. Many soil bacteria and fungi can be antagonistic to root rot fungi. For example, a fungus called Trichoderma has been seen to reduce soil-borne disease infections. In general, additions of organic matter such as compost, grass clippings, and other material provide a food source for the soil food web helping to maintain large active populations of beneficial antagonists. Note that only select fungicide active ingredients are effective on oomycetes such as Phytophthora since they are not true fungi, but rather water molds. Always read and check the label before using a chemical control. Root dips. Some studies have shown that soaking dormant trees before planting in a fungicide solution can result in increased root and shoot growth when plants are grown under conducive conditions and the pathogen is present (Jeffers 1992). Treatment of the root zone. Metalaxyl (MetaStar2E) at 2 gal/acre or 6 fl oz/1000 sq ft. Treat the entire root zone; do not concentrate near the base of the tree. Group 4 fungicide. 48-hr reentry (Bielenin and Jones 1988; Türkölmez and Derviş 2017). Mefenoxam (RidomilGoldSL) at 2 quarts/acre in sufficient water to move it into the root zone. 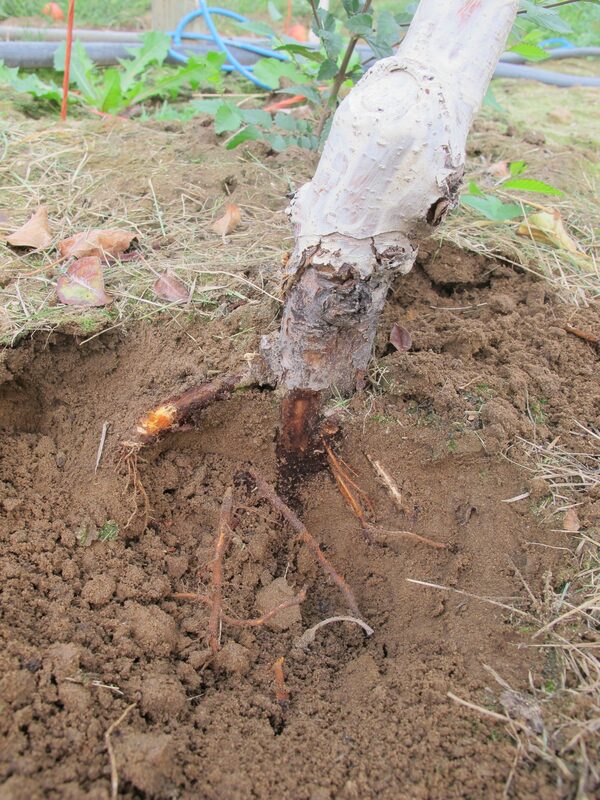 Treat the entire root zone; do not concentrate near the base of the tree. Will not revitalize trees with moderate to severe symptoms. Group 4 fungicide. 48-hr reentry (Adaskaveg 2011). Phosphorus acid, Mono-and di-potassium salts (Agri-Fos, Alude, Fosphite, Oxiphos, Phostrol, Rampart). Do not combine with a copper-spray program for control ofother diseases. Rampart can also be trunk injected. Group 33 fungicide (Flett 1996). Fosetyl AL (Aliette WDG) for bearing and non-bearing apples. For cherry non-bearing trees only. Do not control with a copper spray program. Group 33 fungicide (Utkhede and Smith 1991). Adaskaveg, J.E. 2011. “Efficacy and timing of fungicides, bactericides, and biologicals for deciduous tree fruit, nut, strawberry, and vine crops.” Department of Plant Pathology, University of California Davis. Bielenin, A. and Jones, A. L. 1988. “Efficacy of sprays of fosetyl-Al and drenches of metalaxyl for the control of Phytophthora root and crown rot of cherry.” Plant Disease no. 72:477-480. Carisse, O., and S. Khanizadeh. 2005. “Relative resistance of newly released apple rootstocks to Phytophthora cactorum.” Canadian Journal of Plant Science no. 86:199-204. Flett, S. 1996. “Developing safe foliar spraying of phosphonic acid to control peach and apple Phytophthora.” Project AP253, Final Report, Horticultural Research and Development Corporation, New South Wales. Gardener, B. B. M. 2002. “Biological control of plant pathogens: research, commercialization, and application in the USA.” Plant Health Progress. doi:10.1094/PHP-2002-0510-01-RV. Jeffers, S. N. 1992. “Preplant root treatments to reduce the incidence of Phytophthora species on dormant apple rootstocks.” Plant Disease no. 76:12-19. Robinson, T.L., G. Fazio, H.S Aldwinkle, S.A. Hoying, and N. Russo. 2006. “Field Performance of Geneva Apple Rootstocks in the Eastern USA.” Sodininkeyste IR Darzininkyste no. 25 (3):181-191. Smith, V. L., Wilcox, W.F., and Harman, G.E. 1990. “Potential for biological control of Phytophthora root and crown rots of apple by Trichoderma and Gliocladium spp.” Phytopathology no. 80:880-885. Thomidis, T. Michailidis, Z. 2002. “Preliminary evaluation of nine fungicides for control of Phytophthora cactorum and P. citrophthora associated with crown rot in peach trees.” Phytoparasitica no. 30:52-60. Türkölmez, S. and Derviş, S. 2017. “Activity of metalaxyl-m+mancozeb, fosetyl-al, and phosphorous acid against Phytophthora crown and root rot of apricot and cherry caused by Phytophthora palmivora.” Plant Protect. Sci. no. 53:216-225. Utkhede, R.S, P.L. Sholberg, and M.J. Smirle. 2000. “Effects of chemical and biological treatments on growth and yield of apple trees planted in Phytophthora cactorum infected soil.” Canadian Journal of Plant Science no. 23:163-167. Utkhede, R.S. and Smith, E.M. . 1991. “Effects of fosetyl-al, and Enterobacter aerogenes on crown and root rot of apple trees caused by Phytophthpora cactorum in British Columbia.” Plant Disease no. 75:406-409. 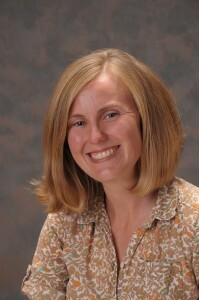 Wilcox, W. F. 1992. “Phytophthora root and crown rots. Phytophthora spp. (deBary).” Tree Fruit Crops-Cornell Cooperative Extension-Disease Identification no. Sheet No. 7. Yamak, F., T. L. Peever, G. G. Grove, and R. J. Boal. 2002. “Occurrence and identification of Phytophthora spp. pathogenic to pear fruit in irrigation water in the Wenatchee River Valley of Washington State.” Phytopathology no. 92 (11):1210-1217. doi: 10.1094/phyto.2002.92.11.1210. Articles from the WSU Tree Fruit website may only be republished with prior author permission © Washington State University. Republished articles with permission must include: “Originally published by Washington State Tree Fruit Extension at treefruit.wsu.edu”, author(s) name, and a link to the original article.